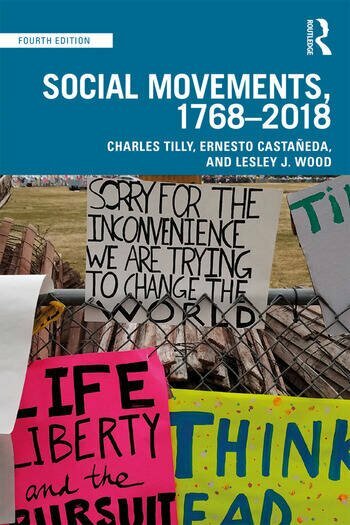 Social Movements 1768-2018 provides the most comprehensive historical account of the birth and spread of social movements. Renowned social scientist Charles Tilly applies his synthetic theoretical skills to explain the evolution of social movements across time and space in an accessible manner full of historical vignettes and examples. Tilly explains why social movements are but a type of contentious politics to decrease categorical inequalities. Questions addressed include what are the implications of globalization and new technologies for social movements, and what are the prospects for social movements? The overall argument includes data from mobilizations in England, Switzerland, Czechoslovakia, Russia, China, India, Argentina, Chile, Cuba, Mexico, Egypt, Tunisia, Iran, Iraq, and Kazakhstan. This new edition has been fully updated and revised with young researchers and students in mind. New case studies focus on social movements in Mexico, Spain, and the United States including Black Lives Matter, immigrants’ rights struggles, The Indignados, the Catalan movement for independence, #YoSoy132, Ayotzinapa43, mass incarceration and prisoner rights, and more. Timelines are included to familiarise the reader with the events discussed and discussion questions are framed to increase understanding of the implications, limits, and importance of historical and ongoing social movements. Charles Tilly was Joseph L. Buttenwieser Professor of Social Science at Columbia University. He is the author of fifty books including The Vendée: A Sociological Analysis of the Counter-Revolution of 1793 (Harvard University Press 1964); Durable Inequality (University of California Press 1999); Contentious Performances (Cambridge University Press 2008); and coauthored with Sidney Tarrow Contentious Politics (2nd Edition, Oxford University Press 2015). Ernesto Castañeda is the author of A Place to Call Home: Immigrant Exclusion and Urban Belonging in New York, Paris, and Barcelona (Stanford University Press 2018), coeditor with Cathy L. Schneider of Collective Violence, Contentious Politics, and Social Change: A Charles Tilly Reader (Routledge 2017), and editor of Immigration and Categorical Inequality: Migration to the City and the Birth of Race and Ethnicity (Routledge 2018). Lesley J. Wood is Associate Professor and Chair of Sociology at York University in Toronto. She is the author of Charles Tilly, one of the premier sociologists of our time, published more than 50 influential books. Lesley Wood, Associate Professor of Sociology at York University in Toronto, Canada, is the author of Crisis and Control: The Militarization of Protest Policing (Pluto Press 2014); and Direct Action, Deliberation and Diffusion: Collective Action after the WTO Protests in Seattle (Cambridge University Press 2014).